The Intersections & Beyond: Meet the new Mozilla Firefox 4! Meet the new Mozilla Firefox 4! Browsing can never be this exciting! Mozilla has upgraded its internet browser with the worldwide launch of the new Firefox 4 on March 22, 2011 (evening in Manila, Philippines). All technologies now keep on developing and improving for ease and convenience, and for us to enjoy a richer online experience. Based on Youtube videos, Firefox started its beta stage since 8 months ago. It only goes to show how serious Mozilla is to give us one of the best (if not the best) browser in the land just to prepare it for 2/3 of a year. Amazing, isn't it? Turn this feature on and protect your browsing history. You can slip in and out of private browsing mode quickly, so it’s easy to go back to what you were doing before as if nothing ever happened. Want to be extra sure about a site’s legitimacy before you hand over your personal info? Click on its favicon for an instant identity overview. Tabs are now located above the Awesome Bar to make it easier to focus on the content of the sites you visit. What's New in Firefox 4? Get to your favorite sites quickly – even if you don’t remember the URLs. Start typing and the Awesome Bar will include possible matches from your browsing history, bookmarked sites and open tabs. As you’re opening a new tab, Firefox will check to see if you already have that site open. If you do, you’ll be directed to the existing tab so you don’t open a duplicate. 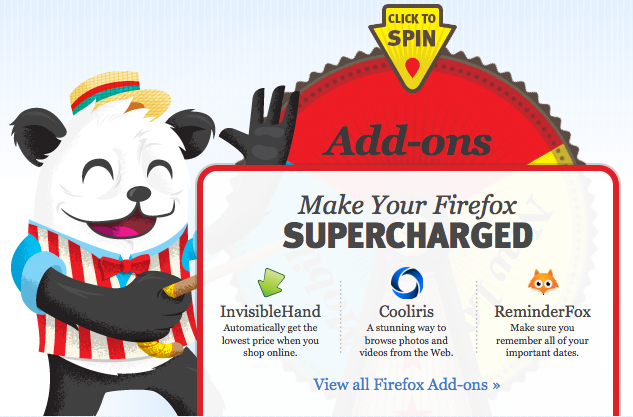 The Add-ons Manager lets you discover and install add-ons without ever leaving Firefox. Browse ratings, recommendations, descriptions and pictures of the add-ons in action to help you make your selection. Firefox can remember your passwords, but does so without intrusive pop-ups. Instead, look for the Remember Password notification integrated seamlessly into your view at the top of the site page. You can adjust Firefox’s interface to be exactly the way you like it: re-arrange, organize, add or remove buttons or fields to change your browsing experience however you want. Change the look of your Firefox in a single click with Personas, easy-to-install themes created by users from around the world (or that you make yourself!). You can also explore more features here.